When life is busy and you need a meal ready to eat as you walk in the door, this is your answer. Whether it’s a family meal or a dinner party, this meal is the perfect answer. Prepare a larger roast than needed for this meal. 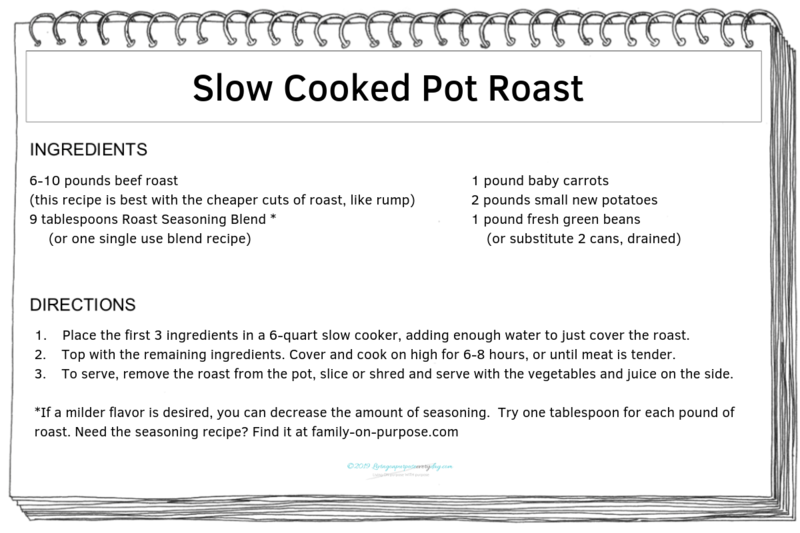 A 6-quart slow cooker will hold up to a 10 pound roast, and you don’t need to use additional seasoning. Take the leftover roast, shred it and save (freeze) it in 2-cup portions in freezer bags to use in other recipes. Shredded roast is great tossed into a vegetable soup, a favorite chili recipe or reheated with a favorite BBQ sauce and served on buns. Our family favorite is to make French Dip Sandwiches using the left over roast and juice. Use the search bar or the category menu in the footer to find the seasoning blend used in this recipe. Just search or click ‘Roast Seasoning Blend’.